Allow us to give you just a brief explanation of how the system works. This system consists of a barometric echo chamber which will allow for high altitude driving and will, also, automatically adjust to sea-level driving. The system will adjust to engine loads down to 2.9 inches of vacuum. This echo chamber gives off high sonic frequencies when vacuum goes through the chamber. This in turn enters the water charge chamber in which is an internal tuning fork. Incoming air velocity collides with this tuning fork at 1200 feet per second which in turn vibrates the tuning fork violently. This results in the cracking of the water which enters into the hydrogen generator making this system more of a fuel cell than a water injection system. Do not be alarmed if you hear a loud "hissing" noise coming from the processor as this is frequency velocity and is necessary for the cracking of the water. It is not a vacuum loss. This is the same principle as an opera singers correct frequency shattering a glass. The result is hydrogen suspension and the only ingredient left is pressure and heat to release its full energy from the combustion. The AquaTunePlus unit creates both hydrogen suspension and flammable gas. What kind of engine, what size or types will this work on? This system will work on any gasoline powered engine including super-charged, turbo and rotary, It is also a huge boost to racing vehicles. We just need to know the size of engine and the number of cylinders In other words, year, make, model and engine size. The Diesel product line is made up of 4 different models, the Aqua- D Model is specifically designed for large commercial applications. It is an industrial unit. The HS 320 HO ( High Output ) is a heavy Diesel or semi truck model designed for engines of common size and use in OTR applications.The HS 320 is for a Medium Duty truck and like size and engine load. 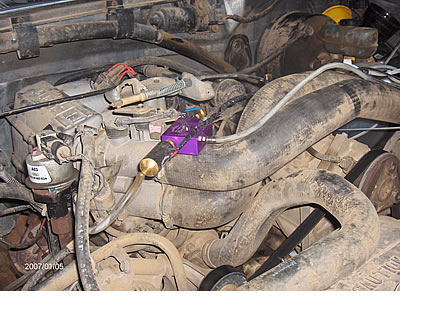 The HS 415 is for small turbo diesel applications in cars and trucks. Diesel applications CANNOT use the gasoline unit, however some high pressure turbo gas applications like CNG engines might use the applicable diesel unit, depending on application. You may click on the photo of the diesel application that fits your needs on the Home page and see photos of installations under the Real World Installations heading. Are there any pumps or electrical circuits that need to be connected? One of the beauties of this system is that it does not require any pumps or cumbersome wires or modules or computer sensor manipulators. On the AquaTunePlus units, only two wires need to be hooked up. One to positive and one to negative. How big is this system? The whole system weighs less than two pounds and can fit in the palm of your hand, that is, without the water reservoir. The contents of this reservoir hold 2 quarts of water. For larger vehicles we also have gallon size containers available. How often must I add water and do I have to add anything else? It is best to check the contents of the water reservoir at every fill-up. On average, the contents of this reservoir will last to approximately 14 to 16 gallons of fuel. It varies from vehicle to vehicle because each one is different and it is also dependent on the driver and driving conditions. During cold weather, any temperatures below 50 degrees, it is necessary that isopropyl alcohol, 70% by volume, be added to act as an anti-freeze. As an added boost for racing vehicles, a 50-50 mixture of water and methanol can be used or a 50-50 mixture of isopropyl alcohol (70% to 99% by volume) and water. You now have an engine that is part hydrogen engine, part formula engine, part gasoline engine and part steam engine. This makes for a very healthy engine. Mean and clean machine! If the water runs out there is no harm to the engine. The only thing that happens is that the fuel economy and the horsepower revert back to what it was before the installation of this system. Are there any other benefits to using this system? Other benefits to your engine are that it keeps the engine oil cleaner longer because of the lack of deposits. It keeps carbon from building up in the combustion chamber and around the valves. Just as cancer is to the human body so is carbon to an engine. It eats away at the metals. This system also keeps engine temperatures down by about 20 degrees Fahrenheit; keeps the O2 sensor clean; keeps the injector stems clean; and, drastically reduces emissions and excessive burning of oil. Fuel efficiency is greatly increased. Drastically reduces unburned fuels and harmful deposits, therefore extending engine life. In fact, the emissions are reduced to the point that the exhaust smells like the by-product of an ozone machine. Both the EGR valve and the catalytic converter are kept clean. Also extends the life of the spark plugs. It stops engine pinging, also known as predetonation. How difficult is it to install and how long does it take? Do I have to make any adjustments? The system is easy to install and takes approximately 1.5 to 3 hours, depending on the persons expertise....Each processor is pre-set in the factory for both water and air injection and is bench-tested to be free of defects. Any tampering to the unit will automatically void the Guarantees other than the air adjustment. The first step for installation is to locate a place for the water tank with a good supporting area away from direct heat such as exhaust manifold. We provide straps with which to stabilize it. Then for mounting the processor: The processor must be mounted slightly higher than the water supply. A bracket is included in the kit to assist you in mounting the processor as close to the point of entry as possible. Six to eight inches from the point of entry is considered ideal. Highly important, make certain that the injection goes in a straight line in! Utilize the PCV vacuum circuit if specified or power booster, if specified only, in the Installation Instructions. It's as simple as "A" to "A" which goes to the vacuum source and "B" to "B" which goes to the water reservoir (refer to the back of the instruction sheet). Then it's time to start the engine and get great fuel mileage and horsepower. Will this system void my new car warranty? No. See U.S. Code - Title 15, Chapter 50, Sec. 2301-2312 of the Magnuson-Moss Warranty Act. Will putting water into my engine rust the internal parts? No. For one thing heat evaporates the water and also note, engines produce "sweat" naturally and the by-product of engine combustion is water. This is the reason you see moisture escaping through the tail-pipe, particularly in the morning. Why haven't I heard of water injection before? Water injection systems have been around since the 1930's. However, they have come and gone in popularity. Ours has remained and is considered the best ever made because this is water injection at its highest level. In short, just as other technology such as the TV, telephone and the computer have improved and changed over the years, so has this system become the highly refined system that it is today. Does it make a difference what kind of spark plugs I use? Most definitely. We have found that the best spark plugs to use are standard copper plugs such as Autolite and/or Iridium plugs. When possible or applicable, you may go to a one-step hotter plug. Double platinum plugs burn too cool. Standard plugs burn at a higher rate which this system needs.. In the newer vehicles Iridium spark plugs are also acceptable. Will I need to continue using premium or mid-grade fuel? No. With this system it's like adding 108 octane and you will receive the best performance by using ONLY lowest octane grade gasoline possible, on most vehicles. Most all turbo-charged and super-charged vehicles, may go to the lowest octane rating. 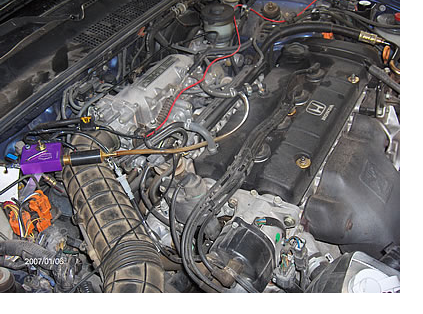 In this installation 1) the processor was, essentially, laid on top of the intake hose, 2) the injection line coming out of the processor has a sharp bend in it and 3) both the injection lines and the water lines were not cut to fit. Please also note, the white coloration of the water feed hose going to the processor is white with calcium build-up. This is generally caused by the use of tap water rather than the recommended distilled water. In this installation, 1) the customer utilized a vacuum tee other than the factory supplied one. 2) the vacuum tee should have mounted close to the manifold and not to the PCV. 3) the processor is too far from the point of entry. The coloration coming from the injection line is normal and should be seen with all AquaTune HB units. This golden color indicates that the generator is properly being powered up.